One can't even begin to fathom what possessed British shirt-making institution Washington Tremlett to add a scattering of coloured swarovski crystals to the bottles of their recent perfume releases, but if one can look past their evident tackiness, Clove Absolute is a launch worthy of some examination. Whilst I adore the smell of fragrant clove buds and relish what they bring to cuisine, Clove Absolute represents more of an abstract of clove. The woody buds (that most would recall pushing into ripe oranges or corned beef at some time or another) are bittersweet, peppery and earthy - something that Washington Tremlett has surprisingly opted to overlook. Instead, I'd imagine a generous dose of eugenol takes pride of place in this composition, along with some shimmering citruses and soft floral accords that adeptly transform this fragrance into something perhaps a little less organic. There is a lovely rose at its heart, and an appealing robust "gruffness" achieved by a dark patchouli base. This being said, what I perhaps enjoy the most about this perfume as it dries on my skin - is the magnificent musk... a musk that echoes the friable glowing presence of Serge Luten's Muscs Koublai Kahn. Between warm wisps of frankincense and resinous labdanum, this musk is truly something to be treasured. Clove Absolute ought to be explored by those who don't shy away from clove, and those who wear musks well. 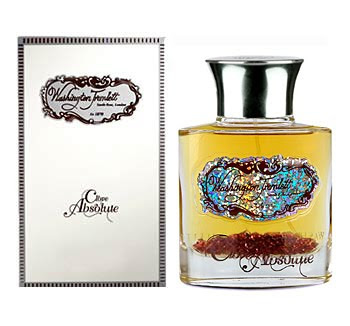 It is available in 100ml size at www.ausliebezumduft.de for €140. The much anticipated inclusion to the Dior Exclusives lineup is Ambre Nuit (Night Amber) - a sensual unisex scent with a lot of promise. Released in the wake of the treasured "black tie" trio of Dior colognes, I felt this creation had much to live up to. As an unwavering devotee of the swamp-green splash Eau Noire, I was satisfied to learn first-hand that Ambre Nuit observes the Exclusives tradition of sophistication and excellence. 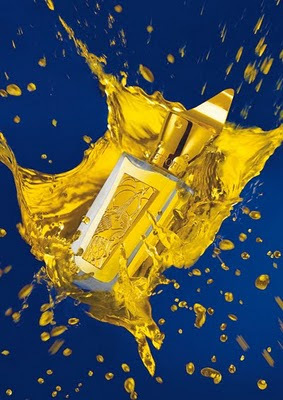 Dior's in-house nose Francois Demachy, (also responsible for other perfume greats such as Ungaro Homme and Acqua di Parma's Colonia Intensa) has fashioned a sultry cologne with a captivating Turkish rose accord at its nucleus. Traditionally reserved for women's perfumery, the rose has been transformed with a sprinkle of pink and black peppercorns into something more gender-neutral in style. On initial application, Calabrian bergamot stirs the senses before the spicy, somewhat masculine rose shifts forward. A wonderful ambery base gradually intensifies from beneath; comprised of resinous labdanum and a delicate, sweet, woody, creamy, slightly smoky guaiacwood accord that acts as both an anchor and fixative. Finally, Indonesian patchouli lends an earthy richness to the framework of the fragrance. Ambre Nuit lives up to (and arguably surpasses) the stylings and exemplary character of the former scents in this lineup. 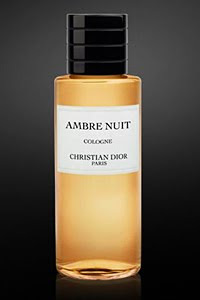 As an eau de cologne applied liberally as intended, Ambre Nuit will last approximately 4-5 hours on my skin - money well spent, in my humble opinion. 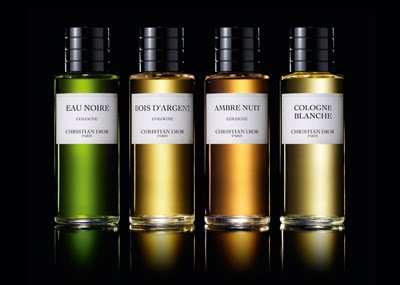 Ambre Nuit and the other Dior Exclusives can be purchased online at www.essenza-nobile.de, starting from €96 for 125ml. Ever since I published my city shopping feature with a focus on Maison Francis Kurkdjian, I have had only praise to sing for this inspired collection. Whilst it is hard to choose a favourite amongst the diverse products offered, the stand out scent for me is Cologne Pour le Soir... an eau de cologne that shatters the "citrus splash" stereotype of most colognes on the market. Recommended as a scent to apply liberally in the evening to evoke sensations of comfort and love, Cologne Pour le Soir shares the resplendent style and tenacity more befitting of an eau de parfum. A fragrance that opens with smouldering accords of rose honey, amber, benzoin and husky incense; it has a marked "hollywood glamour" feeling to it which conjures images of vintage rabbit fur coats, facepowder and lipstick. It evokes a delightful impression of familiarity and admiration... as one might feel toward ones mother or a beloved grandmother perhaps. What I find conceivably most engrossing about this fragrance is its underlying damp and frigid alter-ego... one that exists parallel to the opulent honeyed warmth, and isolated by an imaginary diaphanous membrane. Here, there exists a darker vein that is maybe less apparent at first... it is the scent of eerily dark corridors under the earth, where the ambient temperature is far colder than the surface above, and where the air is trapped inside and stale. It is a gloomy atmosphere that lends a somewhat gothic feeling to this cologne. This masterful chairoscuro between the warm and comforting and the musty and bleak is what sets Cologne Pour le Soir apart from other fragrances in its genre. It represents a very clever marriage between opposing sensations, and in doing renders it a release to be enjoyed by men and women alike. In terms of innovation, I have come to expect no less from master perfumer Kurkdjian. 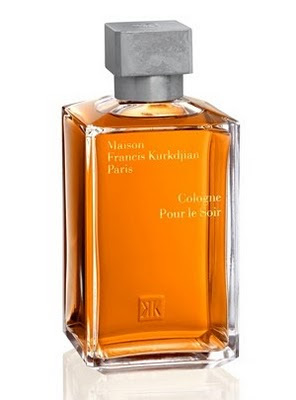 Cologne Pour le Soir is an atypical cologne release, and hence must be explored. Visit the new online shop on www.franciskurkdjian.com for more information on ordering. Kudos once again to Italian luxury purveyors of perfume: XerJoff, whom never seem to disappoint! This time it is the captivating spicy chypre Modoc from their XJ Shooting Stars collection that has won me over. Modoc is an exquisitely crafted marriage between gorgeous soft woods, peppery carnation, earthy vetiver and real Florentine iris butter... the result being a deliciously velvety eau de parfum with warm, spicy elements. As far as traditional chypres go, Modoc seems really rather removed, however it still manages to embody a sense of distinction and timeless refinement that one comes to expect only of XerJoff. Modoc just gets better and better as it evaporates on the skin. This edp lasts a very generous 10-12 hours and can be bought at select retail outlets in the UK, Italy, France and Russia. 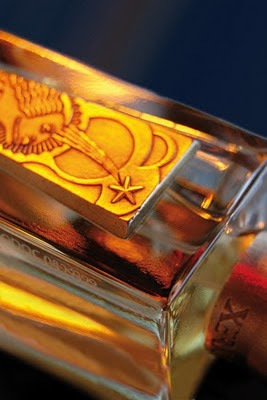 For more information on XerJoff's high-end perfume creations, visit www.xerjoff.com.